The landscape here is extremely barren due to the lack of rainfall in this portion of Peru. Annually they have no rainfall at all with the exception of El Nino years when they might have a shower or two. The soil is a reddish brown in color and very sandy. When the wind blows the sand creates smooth sandy hills. 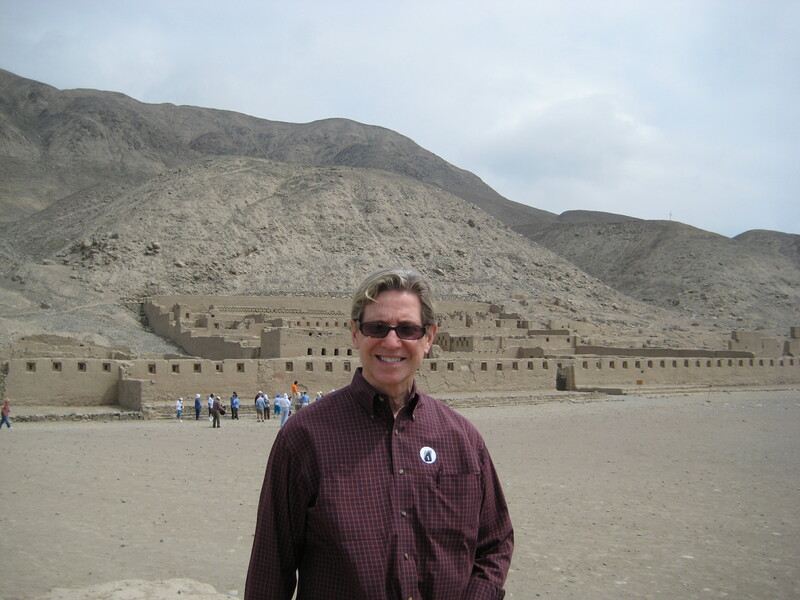 On this day we drive from the ship through the town of Pisco on the coast and then inland through the barren landscape to the ruins of Tambo Colorado. Here we explored a well-preserved adobe and stone structure, built atop an ancient fortress of the pre-Inca culture of Chincha. It was once a grain depository, administrative and military center of the Inca Pachacutec in the 15th century. It is also believed that they used this site to worship the sun, as well as study astronomy and everything related to agriculture. This site is still the best-preserved artifact of the Incan civilization along the Peruvian coast. The site was located along a river and is well preserved considering it was built more than 500 years ago. We were able to walk through the quarters where the royalty and their families, soldiers, common people and virgins lived. There were rooms including storage rooms, bedrooms, baths for bathing with sunken tubs, as well as a lookout tower for the soldiers. Some 2,000 people are believed to have resided here until the Spanish invaded the country. After visiting the ruins we visited a large hacienda and farm where they grow tangerines, macadamia nuts, green asparagus and many varieties of grapes. The grapes are used to produce the liquor called Pisco and is used to make the Pisco sour. Behind the family residence we enjoyed roasted macadamia nuts and potato appetizers before having a buffet lunch. 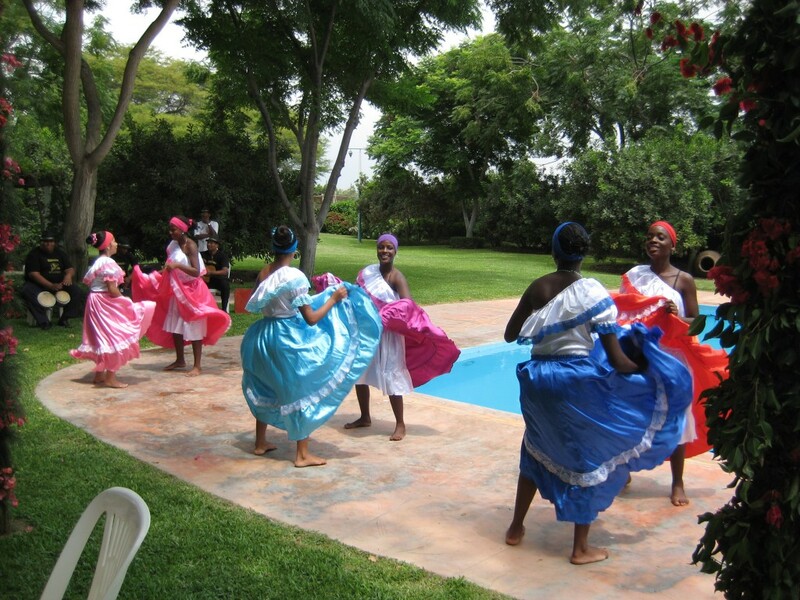 A men’s musical group along with a women’s dance troupe in vibrantly colored dresses performed local dances during the lunch. The buffet included asparagus and mixed vegetables, stewed beef, rice, lima bean salad and potatoes with cheese sauce. Dessert was a napoleon like cake with a chocolate caramel sauce and fresh fruit with honey. On the farm there was also a small weaving factory where we could see how some of the local textiles are made. They also had a small showroom where you could purchase the local textiles made into purses, scarves and clothing items. Pisco was available for tasting with most people thinking it tasted more like rubbing alcohol. A small group of musicians was performing local music and selling CD’s. Tonight’s entertainment is a comedian by the name Jack Mayberry who has performed on the Tonight Show more than twenty times. Even so he was not that funny.